Whether they’ve broken records, shattered glass ceilings or introduced new ways for our city to rally around sports, Columbus is home to many women who pave the way for #SportsInCbus. Each year, the Greater Columbus Sports Commission celebrates women who are taking sports, and Columbus, to the next level at The Women’s Sports Report. From WNBA legend Maya Moore to ESPN play-by-play commentator Beth Mowins, the event has featured an elite lineup of prominent female leaders who we look forward to honoring all year. In just a handful of days, we look forward to adding LPGA legend and broadcasting pioneer Judy Rankin to that impressive list. Rankin is also the 2019 Honoree at the Memorial Tournament presented by Nationwide. At every stage of her career, Katie Smith has found success in Columbus. 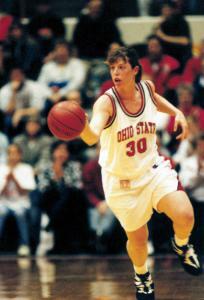 The 2018 Naismith Memorial Basketball Hall of Fame inductee jumped from Ohio State standout to ABL champion with the Columbus Quest, and went on to be a seven-time WNBA All-Star and three-time Olympic Gold Medalist. Even as the current Head Coach of the New York Liberty, Smith continues to find ways to give back to Columbus sports at community events. A graduate of Otterbein herself before taking over as director of athletics in 2012, Dawn Stewart has made an undoubtable impact on campus. In 2016, she was named one of four Division III Under Armour AD of the Year winners and was one of just six women selected for all divisions. 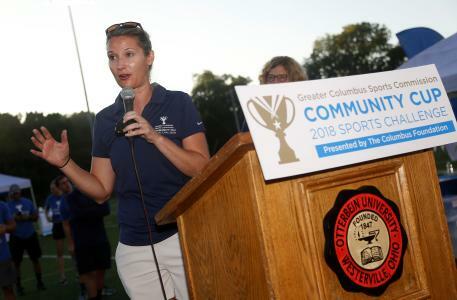 In 2018, Stewart helped the Sports Commission host the first-annual Community Cup at Otterbein, which will return to campus in 2019. It’s impossible to highlight the successful athletes in our city without acknowledging the largest group there is - high school athletes! 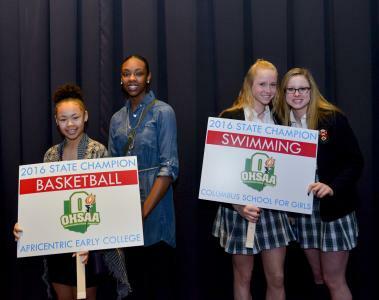 Each year at The Women’s Sports Report, the Sports Commission honors the OHSAA girls state champions from Columbus-area schools. High school state champions set the standard for hard work, determination and focus, and we’re incredibly proud to honor these young ladies each year. 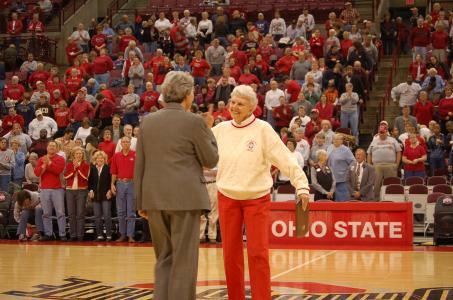 Over the span of her 40-year career, Phyllis Bailey broke countless barriers for women in collegiate sports, advancing women’s athletics at The Ohio State University in a way that rippled across the nation. First as a pioneer as the first women’s basketball coach in school history, then as a driving force to establish organized female intercollegiate competition for the first time, women’s sports as we know it would not be possible without the dedicated women’s empowerment efforts of Bailey. Although she’s recognized as one of the greatest track and field legends to emerge from Ohio State, Stephanie Hightower’s legacy extends beyond her athletic career. Hightower served various roles at USA Track & Field, including women’s manager at the 2004 Olympic Games, before being elected president and chairman of the board in 2008. She gives back to the Columbus community now as the first female president and CEO of the Columbus Urban League. It’s been over three decades since Dixie Jeffers took the reigns of the Capital University women’s basketball team, but she’s yet to slow down. Jeffers entered her 32nd season as just one of 13 coaches in NCAA Division III history to reach the 700-win milestone. She’s led the Crusaders to two NCAA championships and 10 Ohio Athletic Conference tournament titles during her tenure and has even risen to the role of associate director of athletics. OH-IO! 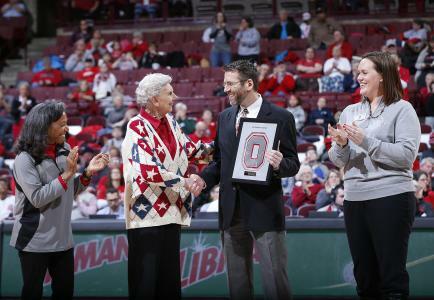 Each year the Sports Commission recognizes Ohio State women national champions at The Women’s Sports Report. 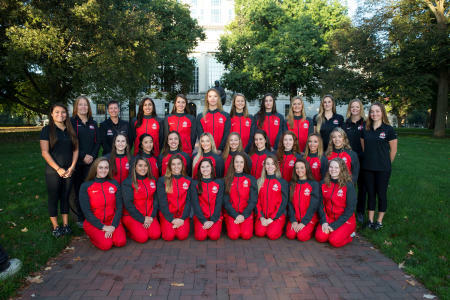 This year we honor synchronized swimming capturing its 31st team national championship in addition to both the solo and duet national titles, and the women of the pistol team contributing to the team’s co-ed open national championship. 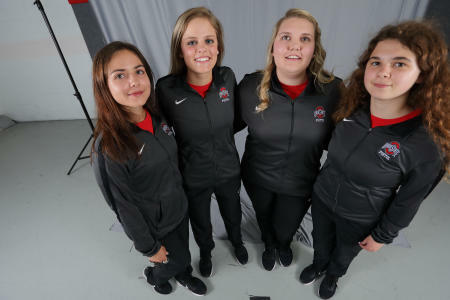 With additional excitement of women’s hockey reaching its first Frozen Four, two women’s basketball players selected in the WNBA draft and the highest NCAA golf individual finisher in program history, it’s been a good year to be a Buckeye. Helping lead the Columbus Blue Jackets organization behind-the-scenes is Kathryn Dobbs, who became the senior vice president and chief marketing officer for the Blue Jackets in December. During her tenure as executive director of the Columbus Blue Jackets Foundation, the charitable arm of the hockey club experienced record-breaking growth and awarded over $1 million to youth hockey in Central Ohio in each of the last three grant cycles. With Dobbs’ help, hockey became more accessible to children, including young girls, across Columbus. We continually say that Columbus Has No Offseason, and it’s because of our fans’ continued enthusiasm and support for our hosted events. Columbus is a sports city unlike anywhere else, the ladies in our community supporting women’s sports continue to set us apart. 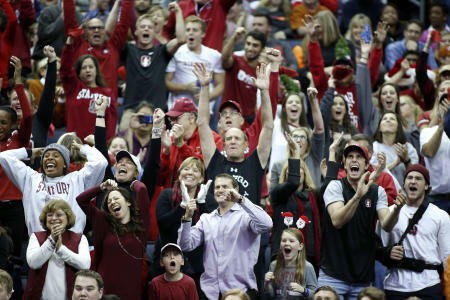 Sellout crowds at the 2018 NCAA Women’s Final Four, record attendance at the 2016 NCAA Division I Volleyball Championship and community commitment to The Women’s Sports Report annually let us know that unwavering support for girls’ and women’s sports is alive and well in Columbus. Thank you, women of Columbus! Columbus supports and celebrates women and girls in sports who are making an impact. Women in Sports is an ongoing blog series featuring those who shape the Columbus sports scene and continue to inspire our community.